Defender Aydil Urbina was accused by the National Police last May 24, 2017, of the alleged offense of interfering with authorities, based on Article 532 of the Penal Code. The first hearing, held on June 20, 2017, was suspended because the plaintiff arrived without legal representation. The hearing was rescheduled for July 6, 2017. Neither the judge nor the National Police plaintiff appeared at the rescheduled hearing. It was scheduled again, but without a specific date, with the argument that a notice would be sent by mail. This situation posed greater stress and uncertainty for Aydil. Given the way events have taken place in this case, it can be stated that the acquittal of Aydil Urbina is an achievement of the timely organization and action by defenders who accompanied and suported her in an emergency. Felicita, also underscored the importance of actions such as the CENIDH press conference held with other members of IN-Defensoras, the complaint filed with Intermal Affairs of the National Police, the complaint lodged with the Human Rights Ombudsman, and the demonstrations with banners and signs outside the Court Building as a way of supporting Aydil during her hearings. It is important to note that Aydil was also supported by community women that she had previously accompanied in situations of violence; they were present from the time Aydil was first arressted at the police station in her neighborhood. 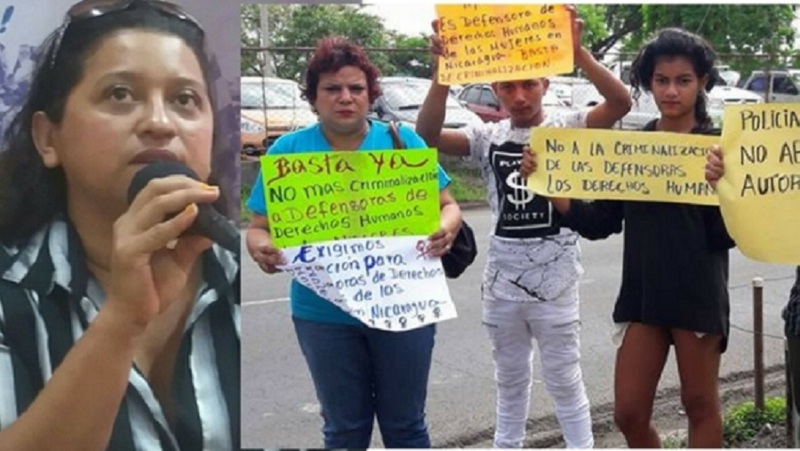 According to FUNDECOM, it is necessary to take up the case of Aydil Urbina once again to visibilize the criminalization of women defenders and set a precedent for actions taken by IN-Defensoras or for proposals made in these kinds of cases.